A dysfunctional relationship between former DUP minister Jonathan Bell and his adviser may have contributed to delays in dealing with the RHI crisis, a senior civil servant has said. Andrew McCormick was the top official in Mr Bell's Enterprise Department at the time. He will give evidence to the RHI inquiry when it resumes on Tuesday. In his witness statements, Mr McCormick said DUP advisers had concerns about Mr Bell's effectiveness. The statements have been published on the RHI website. It has emerged that Mr Bell's special adviser, Timothy Cairns, raised allegations of bullying against Mr Bell, including a claim that he had tried to break his finger and had swung a punch at him. Mr McCormick referenced an Invest NI trade mission to the United States in February 2016. He said Mr Bell had been "visibly tired" at a key meeting after a late night. "It was my impression that in consequence the minister was unable to participate fully in the meeting in as constructive a way as I would have hoped." Mr McCormick said he had not experienced the bullying behaviour ascribed to Mr Bell by others. He said they got on well personally and had a shared interest in Christianity and missionary work. But he said the difficult working relationship between Mr Bell and Mr Cairns had contributed to the department's difficulties in dealing with the unfolding crisis. He said had officials realised that Mr Cairns was only giving advice to Mr Bell after taking soundings from other advisers in the party, they would have pushed harder for a decision on cost controls in the summer of 2015, as concerns mounted about spending on the scheme. Image caption Andrew McCormick was the top official in the Enterprise Department which was running the scheme. Mr Bell is due to give evidence on Thursday. He has already claimed that DUP Spads worked to frustrate the introduction of cost controls and later conspired against him to protect Arlene Foster from damaging fallout over the suspension of the scheme. She was the minister in charge of the Enterprise Department during its design and implementation. 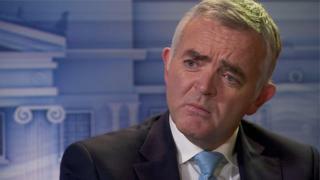 Mr McCormick was asked whether he believed Mrs Foster had acted "without due candour" when she told the BBC's Stephen Nolan that she was not aware of DUP Spad involvement in delays to the introduction of cost controls. He said he was surprised when she said she had "no idea" why there had been a delay. Mr McCormick said he had discussed the reason extensively with DUP Spads and told them it might be best to address the issue directly. He had also discussed with DUP advisers how a relative of their fellow Spad Andrew Crawford had got his boilers accredited the day before the tariff changes. Mr McCormick said the question arose of whether DUP advisers Timothy Johnston and Richard Bullick had told Mrs Foster what they knew as they briefed her for the television interview. The RHI (Renewable Heat Incentive) scheme was established to encourage uptake of eco-friendly heat systems over the use of fossil fuels. An independent inquiry into the RHI scandal was established in January 2017.